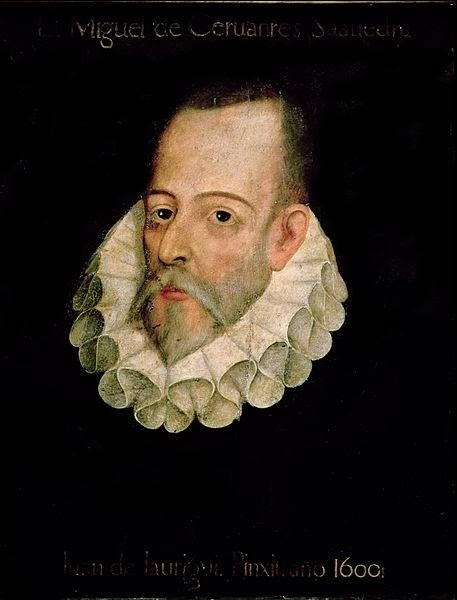 Miguel de Cervantes Saavedra (1547–1616). Don Quixote, Part 1. The romance-stricken Don Quixote sees a fair youth seated by the side of a stream, "his feet like two crystals, his hands like snow?flakes." The youth was a charming girl! Whilst the curate made this speech, the disguised woman stood as one half asleep, now beholding the one, now the other, without once moving her lip or saying a word; just like a rustical clown, when rare and unseen things to him before are unexpectedly presented to his view. ‘In this province of Andalusia there is a certain town from whence a duke derives his denomination, which makes him one of those in Spain are called grandees. He hath two sons—the elder is heir of his states, and likewise, as may be presumed, of his virtues; the younger is heir I know not of what, if he be not of Vellido, his treacheries or Galalon’s frauds. My parents are this nobleman’s vassals, of humble and low calling, but so rich as, if the goods of nature had equalled those of their fortunes, then should they have had nothing else to desire, nor I feared to see myself in the misfortunes wherein I now am plunged, for perhaps my mishaps proceed from that of theirs, in not being nobly descended. True it is that they are not so base as they should therefore shame their calling, nor so high as may check my conceit, which persuades me that my disasters proceed from their lowness. In conclusion, they are but farmers and plain people, but without any touch or spot of bad blood, and, as we usually say, old, rusty Christians, yet so rusty and ancient as yet their riches and magnificent port gain them, by little and little, the title of gentility, yea, and of worship also; although the treasure and nobility whereof they made most price and account was to have had me for their daughter; and therefore, as well by reason that they had none other heir than myself, as also because, as affectionate parents, they held me most dear, I was one of the most made of and cherished daughters that ever father brought up. I was the mirror wherein they beheld themselves, the staff of their old age, and the subject to which they addressed all their desires, from which, because they were most virtuous, mine did not stray an inch; and even in the same manner that I was lady of their minds, so was I also of their goods. By me were servants admitted or dismissed; the notice and account of what was sowed or reaped passed through my hands; of the oil-mills, the wine-presses, the number of great and little cattle, the bee-hives—in fine, of all that so rich a farmer as my father was, had, or could have, I kept the account, and was the steward thereof and mistress, with such care of my side, and pleasure of theirs, as I cannot possibly endear it enough. The times of leisure that I had in the day, after I had given what was necessary to the head servants and other labourers, I did entertain in those exercises which were both commendable and requisite for maidens, to wit, in sewing, making of bone lace, and many times handling the distaff; and if sometimes I left those exercises to recreate my mind a little, I would then take some godly book in hand, or play on the harp; for experience had taught me that music ordereth disordered minds, and doth lighten the passions that afflict the spirit. ‘And scarce had he seen me, when (as he himself after confessed) he abode greatly surprised by my love, as his actions, did after give evident demonstration. But to conclude soon the relation of those misfortunes which have no conclusion, I will overslip in silence the diligences and practices of Don Fernando, used to declare unto me his affection. He suborned all the folk of the house; he bestowed gifts and favours on my parents. Every day was a holiday and a day of sports in the streets where I dwelt; at night no man could sleep for music. The letters were innumerable that came to my hands, without knowing who brought them farsed too full of amorous conceits and offers, and containing more promises and protestations, than characters. All which not only could not mollify my mind, but rather hardened it so much as if he were my mortal enemy; and therefore did construe all the endeavours he used to gain my goodwill to be practised to a contrary end; which I did not as accounting Don Fernando ungentle, or that I esteemed him too importunate; for I took a kind of delight to see myself so highly esteemed and beloved of so noble a gentleman; nor was I anything offended to see his papers written in my praise; for, if I be not deceived in this point, be we women ever so foul, we love to hear men call us beautiful. But mine honesty was that which opposed itself unto all these things, and the continual admonitions of my parents, which had by this plainly perceived Don Fernando’s pretence, as one that cared not all the world should know it. They would often say unto me that they had deposited their honours and reputation in my virtue alone and discretion, and bade me consider the inequality that was between Don Fernando and me, and that I might collect by it how his thoughts (did he ever so much affirm the contrary) were more addressed to compass his pleasures than my profit; and that if I feared any inconvenience might befall, to the end they might cross it, and cause him to abandon his so unjust a pursuit, they would match me where I most liked, either to the best of that town or any other adjoining, saying, they might easily compass it, both by reason of their great wealth and my good report. I fortified my resolution and integrity with these certain promises and the known truth which they told me, and therefore would never answer to Don Fernando any word that might ever so far off argue the least hope of condescending to his desires. All which cautions of mine, which I think he deemed to be disdains, did inflame more his lascivious appetite (for this is the name wherewithal I entitle his affection towards me), which, had it been such as it ought, you had not known it now, for then the cause of revealing it had not befallen me. Finally, Don Fernando, understanding how my parents meant to marry me, to the end they might make void his hope of ever possessing me, or at least set more guards to preserve mine honour, and this news or surmise was an occasion that he did what you shall presently hear. ‘For, one night as I sat in my chamber, only attended by a young maiden that served me, I having shut the doors very safe, for fear lest, through my negligence, my honesty might incur any danger, without knowing or imagining how it might happen, notwithstanding all my diligences used and preventions, and amidst the solitude of this silence and recollection, he stood before me in my chamber. At his presence I was so troubled as I lost both sight and speech, and by reason thereof could not cry, nor I think he would not, though I had attempted it, permit me; for he presently ran over to me, and, taking me between his arms (for, as I have said, I was so amazed as I had no power to defend myself), he spake such things to me as I know not how it is possible that so many lies should have ability to feign things resembling in show so much the truth; and the traitor caused tears to give credit to his words, and sighs to give countenance to his intention. When Cardenio heard her say that she was called Dorothea, he fell again into his former suspicion, and in the end confirmed his first opinion to be true, but would not interrupt her speech, being desirous to know the success, which he knew wholly almost before, and therefore said only, ‘Lady, is it possible that you are named Dorothea? I have heard report of another of that name, which perhaps hath run the like course of your misfortune; but I request you to continue your relation, for a time may come wherein I may recount unto you things of the same kind, which will breed no small admiration.’ Dorothea noted Cardenio’s words and his uncouth and disastrous attire, and then entreated him very instantly if he knew anything of her affairs he would acquaint her therewithal; for if fortune had left her any good, it was only the courage which she had to bear patiently any disaster that might befall her, being certain in her opinion that no new one could arrive which might increase a whit those she had already. ‘Lady, I would not let slip the occasion,’ quoth Cardenio, ‘to tell you what I think, if that which I imagine were true; and yet there is no commodity left to do it, nor can it avail you much to know it.’ ‘Let it be what it list,’ said Dorothea; ‘but that which after befel of my relation was this: That Don Fernando took an image that was in my chamber for witness of our contract, and added withal most forcible words and unusual oaths, promising unto me to become my husband; although I warned him, before he had ended his speech, to see well what he did, and to weigh the wrath of his father when he should see him married to one so base and his vassal, and that therefore he should take heed that my beauty (such as it was) should not blind him, seeing he should not find therein a sufficient excuse for his error, and that if he meant to do me any good, I conjured him, by the love that he bore unto me, to licence my fortunes to rule in their own sphere, according as my quality reached; for such unequal matches do never please long, nor persevere with that delight wherewithal they began. ‘All the reasons here rehearsed I said unto him, and many more which now are fallen out of mind, but yet proved of no efficacy to wean him from his obstinate purpose; even like unto one that goeth to buy, with intention never to pay for what he takes, and therefore never considers the price, worth, or defect of the stuff he takes to credit. I at this season made a brief discourse, and said thus to myself, “I may do this, for I am not the first which by matrimony hath ascended from a low degree to a high estate; nor shall Don Fernando be the first whom beauty or blind affection (for that is the most certain) hath induced to make choice of a consort unequal to his greatness. Then, since herein I create to new world nor custom, what error can be committed by embracing the honour wherewithal fortune crowns me, although it so befel that his affection to me endured no longer than till he accomplished his will? for before God I certes shall still remain his wife. And if I should disdainfully give him the repulse, I see him now in such terms as, perhaps forgetting the duty of a nobleman, he may use violence, and then shall I remain for ever dishonoured, and also without excuse of the imputations of the ignorant, which knew not how much without any fault I have fallen into this inevitable danger; for what reasons may be sufficiently forcible to persuade my father and others that this nobleman did enter into my chamber without my consent?” All these demands and answers did I, in an instant, revolve in mine imagination, and found myself chiefly forced (how I cannot tell) to assent to his petition by the witnesses he invoked, the tears he shed, and finally by his sweet disposition and comely feature, which, accompanied with so many arguments of unfeigned affection, were able to conquer and enthrall any other heart, though it were as free and wary as mine own. Then called I for my waiting-maid, that she might on earth accompany the celestial witnesses. ‘And then Don Fernando turned again to reiterate and confirm his oaths, and added to his former other new saints as witnesses, and wished a thousand succeeding maledictions to light on him if he did not accomplish his promise to me. His eyes again waxed moist, his sighs increased, and himself enwreathed me more straitly between his arms, from which he had never once loosed me; and with this, and my maiden’s departure, I left to be a maiden, and he began to be a traitor and a disloyal man. The day that succeeded to the night of my mishaps came not, I think, so soon as Don Fernando desired it; for, after a man hath satisfied that which the appetite covets, the greatest delight it can take after is to apart itself from the place where the desire was accomplished. I say this, because Don Fernando did hasten his departure from me: by my maid’s industry, who was the very same that had brought him into my chamber, he was got in the street before dawning. And at his departure from me he said (although not with so great show of affection and vehemency as he had used at his coming) that I might be secure of his faith, and that his oaths were firm and most true; and for a more confirmation of his word, he took a rich ring off his finger and put it on mine. In fine, he departed, and I remained behind, I cannot well say whether joyful or sad; but this much I know, that I rested confused and pensive, and almost beside myself for the late mischance; yet either I had not the heart, or else I forgot to chide my maid for her treachery committed by shutting up Don Fernando in my chamber; for as yet I could not determine whether that which had befallen me was a good or an evil. ‘I said to Don Fernando, at his departure, that he might see me other nights when he pleased, by the same means he had come that night, seeing I was his own, and would rest so, until it pleased him to let the world know that I was his wife. But he never returned again but the next night following, nor could I see him after, for the space of a month, either in the street or church, so as I did but spend time in vain to expect him; although I understood that he was still in town, and rode every other day a-hunting, an exercise to which he was much addicted. ‘Those days were, I know, unfortunate and accursed to me, and those hours sorrowful; for in them I began to doubt, nay, rather wholly to discredit Don Fernando’s faith; and my maid did then hear loudly the checks I gave unto her for her presumption, ever until then dissembled; and I was, moreover, constrained to watch and keep guard on my tears and countenance, lest I should give occasion to my parents to demand of me the cause of my discontents, and thereby engage me to use ambages or untruths to cover them. But all this ended in an instant, one moment arriving whereon all these respects stumbled, all honourable discourses ended, patience was lost, and my most hidden secrets issued in public; which was, when there was spread a certain rumour throughout the town, within a few days after, that Don Fernando had married, in a city near adjoining, a damsel of surpassing beauty, and of very noble birth, although not so rich as could deserve, by her preferment or dowry, so worthy a husband; it was also said that she was named Lucinda, with many other things that happened at their espousals worthy of admiration.’ Cardenio hearing Lucinda named did nothing else but lift up his shoulders, bite his lip, bend his brows, and after a little while shed from his eyes two floods of tears. But yet for all that Dorothea did not interrupt the file of her history, saying, ‘This doleful news came to my hearing; and my heart, instead of freezing thereat, was so inflamed with choler and rage, as I had well-nigh run out to the streets, and with outcries published the deceit and treason that was done to me; but my fury was presently assuaged by the resolution which I made to do what I put in execution the very same night, and then I put on this habit which you see, being given unto me by one of those that among us country-folk are called swains, who was my father’s servant; to whom I disclosed all my misfortunes, and requested him to accompany me to the city where I understood my enemy sojourned. He, after he had reprehended my boldness, perceiving me to have an inflexible resolution, made offer to attend on me, as he said, unto the end of the world; and presently after I trussed up in a pillow-bear a woman’s attire, some money, and jewels, to prevent necessities that might befal; and in the silence of night, without acquainting my treacherous maid with my purpose, I issued out of my house, accompanied by my servant and many imaginations, and in that manner set on towards the city, and though I went on foot, was yet borne away flying by my desires, to come, if not in time enough to hinder that which was past, yet at least to demand of Don Fernando that he would tell me with what conscience of soul he had done it. I arrived where I wished within two days and a half; and at the entry of the city I demanded where Lucinda her father dwelt; and he of whom I first demanded the question answered me more than I desired to hear. He showed me the house, and recounted to me all that befel at the daughter’s marriage, being a thing so public and known in the city, as men made meetings of purpose to discourse thereof. ‘He said to me that the very night wherein Don Fernando was espoused to Lucinda, after she had given her consent to be his wife, she was instantly assailed by a terrible accident that struck her into a trance, and her spouse approaching to unclasp her bosom that she might take the air; found a paper folded in it, written with Lucinda’s own hand, wherein she said and declared that she could not be Don Fernando’s wife, because she was already Cardenio’s, who was, as the man told me, a very principal gentleman of the same city; and that if she had given her consent to Don Fernando, it was only done because she would not disobey her parents. In conclusion, he told me that the paper made also mention how she had a resolution to kill herself presently after the marriage, and did also lay down therein the motives she had to do it; all which, as they say, was confirmed by a poniard that was found hidden about her in her apparel. Which Don Fernando perceiving, presuming that Lucinda did flout him, and hold him in little account, he set upon her ere she was come to herself, and attempted to kill her with the very same poniard, and had done it, if her father and other friends which were present had not opposed themselves and hindered his determination. Moreover, they reported that presently after Don Fernando absented himself from the city, and that Lucinda turned not out of her agony until the next day, and then recounted to her parents how she was verily spouse to that Cardenio of whom we spake even now. I learned besides that Cardenio, as it is rumoured, was present at the marriage, and that as soon as he saw her married, being a thing he would never have credited, departed out of the city in a desperate mood, but first left behind him a letter, wherein he showed at large the wrong Lucinda had done to him, and that he himself meant to go to some place where people should never after hear of him. All this was notorious, and publicly bruited throughout the city, and every one spoke thereof, but most of all having very soon after understood that Lucinda was missing from her parent’s house and the city, for she could not be found in neither of both; for which her parents were almost beside themselves, not knowing what means to use to find her. ‘These news reduced my hopes again to their ranks, and I esteemed it better to find Don Fernando unmarried than married, presuming that yet the gates of my remedy were not wholly shut, I giving myself to understand that Heaven had peradventure set that impediment on the second marriage to make him understand what he ought to the first, and to remember how he was a Christian, and that he was more obliged to his soul than to human respects. I revolved all these things in my mind, and comfortless did yet comfort myself, by feigning large yet languishing hopes, to sustain that life which I now do so much abhor. And whilst I stayed thus in the city, ignorant what I might do, seeing I found not Don Fernando, I heard a crier go about publicly, promising great rewards to any one that could find me out, giving signs of the very age and apparel I wore; and I likewise heard it was bruited abroad that the youth which came with me had carried me away from my father’s house—a thing that touched my soul very nearly, to view my credit so greatly wrecked, seeing that it was not sufficient to have lost it by my coming away, without the addition [of] him with whom I departed, being a subject so base and unworthy of my loftier thoughts. Having heard this cry, I departed out of the city with my servant, who even then began to give tokens that he faltered in the fidelity he had promised to me; and both of us, together entered the very same night into the most hidden parts of this mountain, fearing lest we might be found. But, as it is commonly said that one evil calls on another, and that the end of one disaster is the beginning of a greater, so proved it with me; for my good servant, until then faithful and trusty, rather incited by his villainy than my beauty, thought to have taken the benefit of the opportunity which these inhabitable places offered, and solicited me of love, with little shame and less fear of God, or respect of myself; and now seeing that I answered his impudences with severe and reprehensive words, leaving the entreaties aside wherewithal he thought first to have compassed his will, he began to use his force; but just Heaven, which seldom or never neglects the just man’s assistance, did so favour my proceedings, as with my weak forces, and very little labour, I threw him down a steep rock, and there I left him, I know not whether alive or dead; and presently I entered in among these mountains with more swiftness than my fear and weariness required, having therein no other project or design than to hide myself in them, and shun my father and others, which by his entreaty and means sought for me everywhere.